Marketing Technology: Too Much of a Good Thing? 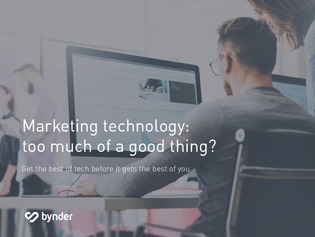 There’s a lot to love about marketing technology, but it’s important to make sure it’s working for you, not against you. The abundance of marketing technology is a good thing. It only turns bad when good solutions pile up into a roadblock that impedes marketing’s overall success. Discover how you can avoid this with a framework that recognizes the goals of each function, the best connections between them and how to best support each today with an eye towards adapting to the changes of tomorrow.